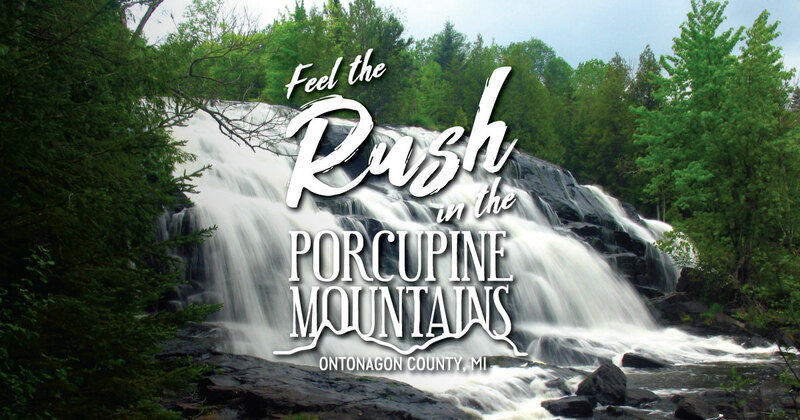 The Porcupine Mountains and Ontonagon County receive as much as 200 inches of snow each year, and when that snow melts, magic happens. Waterfalls in the Porcupine Mountains and Ontonagon County put on powerful and dramatic spring displays that rival woodland rivers anywhere in the Midwest. There are many waterfalls located in the heart of the Porcupine Mountains and many more a short, scenic drive away. Often considered one of the most scenic falls in the Upper Peninsula, Agate Falls is located on the middle branch of the Ontonagon River. The falls are located off Highway 28, about six miles southeast of Bruce Crossing. These easy-to-reach falls are located on the Big Iron River south of Silver City. The numerous natural pools and small drops are perfect for exploration on a warm day. These breathtaking falls, located about an hour south of the Porcupine Mountains, are well worth the drive. Located on the middle branch of the Ontonagon River, Bond Falls has a drop of about 50 feet over a wide belt of fractured rock, creating several small cascades. Located on the western edge of the Porcupine Mountains Wilderness State Park, the Presque Isle River is home to three beautiful waterfalls—Manabezho, Manido and Nawadaha. Note: the parking area is closed until the South Boundary Road opens in spring; a short hike may be required if you visit before May. Learn more about waterfalls in the Porcupine Mountains and Ontonagon County.